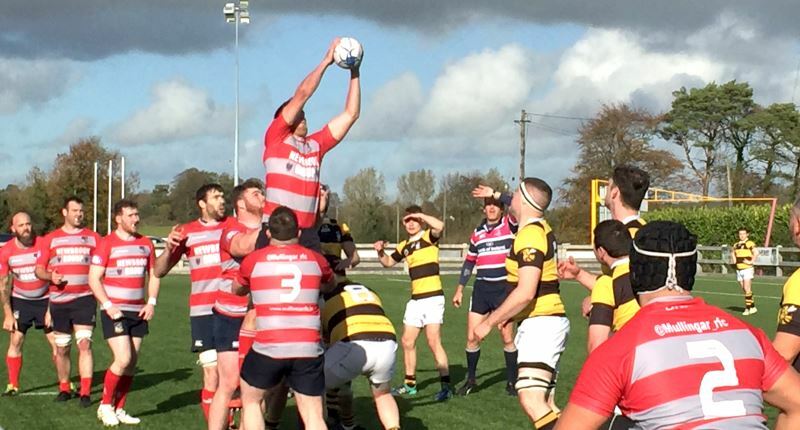 Despite recent mutterings towards positivity of future, Mullingar’s season took a dark turn towards Sisyphus on Sunday when they folded far too softly in front of a team that was not 20 points their superior. Despite mounting a second half comeback to parity with a scrum that had the nudge, somehow they managed to find the Hades-bound wickerwork and now face a season in dire need of a Sherpa or two. And they started so well, firing on all cylinders in the Newbridge 22 for the first five minutes, until the ref gave Flynn his first flag raiser. But as was to be a significant pattern, every time Mullingar showed, Newbridge flexed back with more than enough and were on terms almost immediately. McGivney had to have all wits about in the corner in the 10th when their winger went all the way down the right from the re-start, as the warning was issued. Despite seeming to have the set-pieces clicking clean, Mullingar handling in phases 2 plus handed back any slight advantage, and the lead, with a 21stminute penalty. With the breeze Mullingar still showed promise as Moore, Midic, and Arthur all went close, but again handling in contact let them down. Still, Rocky and Wally conspired to keep a dying ball alive and earned Flynn an equaliser shot, but it was pushed off by the breeze in the 33rdminute. Then, with four remaining, Newbridge struck like we feared they could and stuck one under the sticks. And yet, Mullingar still had enough game in the half to press them close, but again, a dearth of sticky paws allowed the visitors reach the break 10 points to the good. Clearly piqued, Mullingar came out red hot and earned one for the Stuart Flynn in the opening minute. Quinn then showed the way, and some expansiveness circulated. In the 7th minute they actually managed to cross after a good line-out rumble from the corner, but were held up. However, they nerve and territory was held, and from the subsequent scrum, Mullingar monstered and created enough space wide for Stewie Flynn to bash through and gain a deserved parity. Once again, though, Newbridge countered with discipline and aplomb and re-took the lead in 15th minute when their prop picked a dump truck route from short. Mullingar were still very much in the game and after pressuring the super re-start from Flynn, nearly conspired to get Arthur into the top corner. Just like before, Mullingar managed to stay in the neighbourhood threateningly for a couple of phases until TC found half a hole and, even despite some awful hands, managed to ferry it ugly to Wallace for a very relieving strollover. Again, Newbridge immediately flexed back, and Mullingar were lucky not to concede a third try, but couldn’t help the penalty to put five between the sides. Playing right cannily, Newbridge bossed the ensuing minutes and with eight minutes remaining popped the rarest of things in the modern game – an insurance drop goal – for a very important eight-point lead. Mullingar began to fade measurably here, and without seeming to really threaten with proper intent, the visitors somehow managed to conjure up a late brace and pilfered a most unexpected bonus point win. Mullingar have a fortnight off to lick their wounds and gather their thoughts, before heading up the M4 to D4 and a trip to Railway Union on November 4. Fresh from enjoying their walk-over from Gorey this weekend, the Heifers have to wait until November 11 when they take on old rivals Edenderry, before facing Clondalkin under lights on the ensuing Friday (November 16). Team: 1. Ben Glennon, 2. Alex Midic, 3. Darren ‘Daz’ Brady, 4. Daryl Quinn , 5. ‘Cheddar’ McNay, 6. Sean Ennis, 7. Cormac Dunne, 8. Darach Geraghty, 9. Sean Rock, 10. Thomas ‘TC’ Campbell, 11. Arthur Brabazon, 12. Stewie Flynn, 13. Ronan Wallace, 14. Eoin Moore, 15.Anthony McGivney. Subs used: Ed Nally, Cillian Kavanagh, Sean Ennis, Alan Donoghue. Overall Club Try scorers (as of Oct 21): Nikki Feery, Eoghan Moore, Flynn, (3) Alan Brabazon, Daniels Wallace(2) Quinn, TC, Midic, Fitzpatrick, Rock, Geraghty, Arthur Brabazon, Neale, Gilleran, Cooney, Boland.